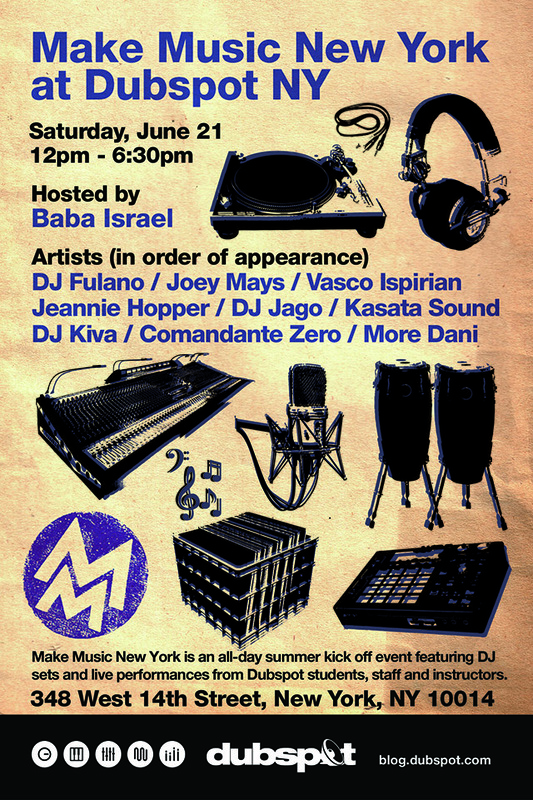 On Saturday, June 21st, Dubspot joins Make Music New York for a series of outdoor performances in the heart of the city featuring DJ Fulano, Joey Mays, Vasco Ispirian, Jeannie Hopper, DJ Jago, Kasata Sound, DJ Kiva, Comandante Zero and More Dani. DJ Fulano, Joey Mays, Vasco Ispirian, OP!, DJ Jago, Kasata Sound, DJ Kiva, Comandante Zero, and More Dani. Hosted by Baba Isreal. 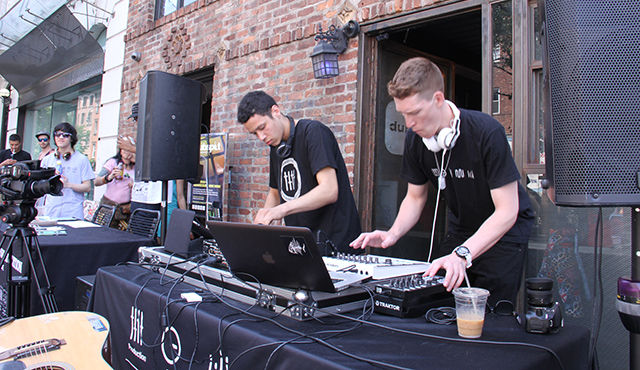 Join us on Saturday, June 21st from 12-6:30pm In front of Dubspot NYC (348 West 14th Street, New York, NY 10014) for an all-day summer kick off event featuring DJ sets and live performances from Dubspot students, staff and instructors. Check out our Facebook event page and come join us on June 21st in New York City! Brooklyn artist & founder of record label Adios Babylon as well as veteran Dubspot instructor. DJ Kiva is the founder of NYC based recording studio and record label, Adios Babylon. Kiva has released numerous albums and has produced and remixed for many soul, reggae, & dance music artists. His style blends elements of dub, afro-cuban, soul, hip hop, and futuristic electronics. He has delivered his music through high energy performances and DJ sets at live events from Brooklyn to Berlin. His production and remixes have been released on such labels as Adios Babylon, Destroy All Concepts, King Tubbys Dub Heritage Foundation, Bagpak, Tommy Boy, and Kindred Spirits. His music has received airplay on BBC’s 1Xtra and Sirius Satellite Radio. He has appeared as a guest speaker & performer on Public Enemy founder Hank Shocklee’s Producer Panel at Remix magazine’s “Remix Hotel NYC” event. Kiva has toured extensively around the globe as live guitarist for hip hop groups “Shape of Broad Minds” and “Willie Isz” featuring Jneiro Jarel and Khujo Goodie of Goodie Mob and has performed at such festivals as Sonar (Spain), Hove (Norway), Roskilde (Denmark), and Montreaux Jazz (Switzerland). DJ Kiva is an Ableton Live certified trainer; he currently teaches electronic music production at New York City DJ & Music Production School Dubspot, mentoring and sharing knowledge to a new generation of upcoming producers from around the world. Brooklyn resident Kane Mathis began making trips to West Africa 16 years ago to study the mandinka kora, a 21-string bridge-harp used extensively in Gambia. Last year he became the only non-African to become certified by the National Center for Arts and Culture in Gambia. Kane has appeared on Gambian national television and radio, and has performed for the President of The Gambia. He holds a diploma from the Tiramang Traditonal Music School and also studied the Turkish Oud in Istanbul, where he completed a 5-year apprenticeship with Oud virtuoso Münir Nurettin Beken. 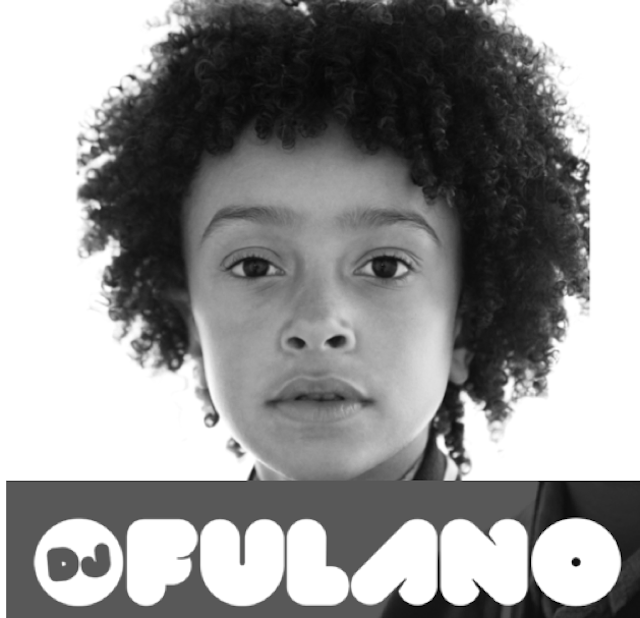 DJ Fulano is the life of the party…and he is only ten-years-old. Born on July 13, 2003 in New York City and raised in Harlem, Fulano was surrounded by art before ever taking his first breath. His mother, Latham Thomas, a renowned wellness specialist, filled their house with the sounds of Stevie Wonder, Fela Kuti, and A Tribe Called Quest on the weekdays, while on the weekends, his father, visual artist, Nemo Librizzi, filled the house with the sounds of Nina Simone, Roy Ayers, and other artists he played on his radio show, Jazz Alternatives. Fulano was further exposed to fine art by his grandfather, veteran New York contemporary art dealer, Rick Librizzi, who was a close friend of Andy Warhol. After stumbling upon a DJ Cassidy classic-soul compilation on the internet, Fulano immediately became infatuated with the iconic deejay known for rocking parties around the world for Jay-Z, Beyonce, Diddy, Jennifer Lopez, Kanye West, Russell Simmons, Anna Wintour, Naomi Campbell, Oprah Winfrey, and President Obama. Fulano began tweeting Cassidy every morning before school, sending him links to download his mixes. Then, by coincidence, Cassidy was referred to Fulano’s mother for yoga instruction. When the two deejays finally met, a mentor and protégé were born. Head over to DJ Fulano’s site to read more. Dani studied voice at the Eastman School of Music, Ithaca College and is now studying Ableton Live and Logic with Dubspot. Her interests lie in blending live instruments, found sounds and electronic elements. After years of touring nationally as a back-up singer and percussionist, Dani DiCiaccio is now answering the demands of those who’ve yelled at the sound engineer to “turn her up!” and told lead singers to ‘shush!’: MORE DANI! She teaches private voice lessons, works with renowned DJ Jon Oliver on his podcast ‘The Main Ingredient’ and at Dubspot. You can visit her website at moredani.com. Download a track from More Dani, “Year of the Dog” on Soundcloud! Learn to sing with More Dani! 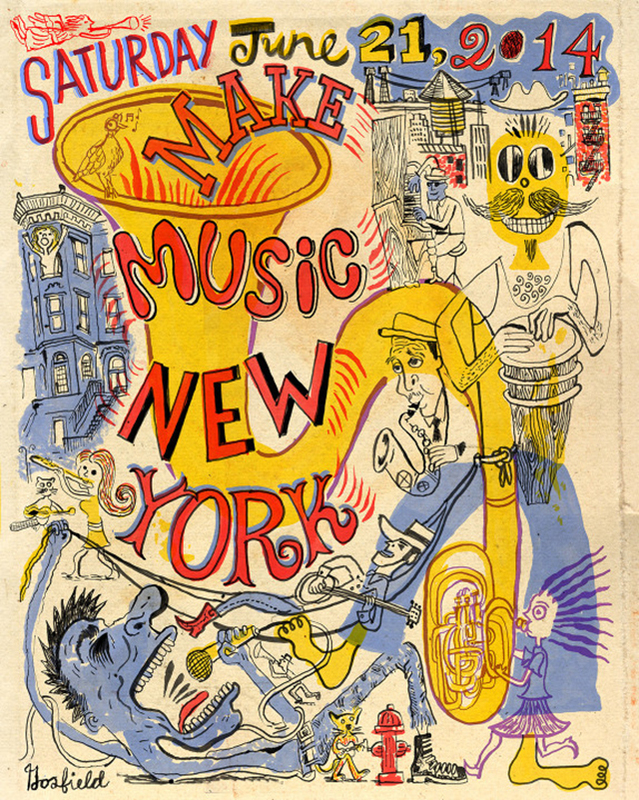 Email moredanimusic@gmail.com and reference Make Music New York for a chance to win 2 free voice lessons! Enter today! Known in NYC and around the globe as a purveyor of all things soulful, OP! is a talented DJ and taste-maker who can hang on just about any dance floor. From hip hop, house, and classics to future soul, UK funky and South African house, OP! can finesse them all, adopting musical diversity and focusing it into a beautifully cohesive vibe. Through his current works with I Love Vinyl and Dubspot along with his past works with Suite903, Raw Fusion NYC, OkayAfrica, and Party People South Africa, on the DJ side; and Decon, Cornerstone Promotion/The Fader, and Studio Distribution/BBE, on the industry side, OP! has been instrumental in shining a light on underground and global soul, and continues to champion its relevance on the world stage. His strong interest in music in his early years reinforced by guitar and music studies lead him to participate and diverse projects in Spain, as well as Greece. Influenced by acid, raw techno and early house music, in the mid 90’s Vasco initiated his electronic adventure. Promoter of Innerlife, one of the most influential music collectives of the past decades, he has left trace in the best clubs of Madrid (The Room, Long Play, Goa, Weekend, Deep, Soma, amongst others) and other regions in Spain and around the globe such as his notable presence in Observatori ’05 (Valencia) and SONAR ’08 (Barcelona). Since the beginning of 2003 he is resident of The Room (www.theroomclub.com), a club that has shown its support for current electronic music and has hosted reputed artists that are key references in the electronic music scene, such as: Jazzanova, Stacey Pullen, Maurice Fulton, Chris Duckenfield aka Swag, Tom Middletom, Dj Heather, Peter Kruder, Brooks, Âme, Martin Landsky, Richard Dorfmeister, Bill Brewster, Alexi Delano, Inland Knights, Bobby Peru, Brett Jhonson, Dixon, I:Cube, Matthias Tanzmann, C-Rock, Samim, Jamie Jones, Baby Ford, Marco Resmann, Radio Slave, Simon Flower, Marcel Dettmann, Cassy, Redshape, Quince and many more like Dj Deep in its last 11th aniversary. Every Friday, at the club The Room is where he develops all his creativity and where he lets his most intimate emotions flow as an artist. The key of his success is in the selection of music and his particular style mixing house-techno-acid-dub is what makes Vasco Ispirián considered one of the most respected contemporary artists by an extremely demanding audience. Back to music productions, labels like “Scuba Dive Music” and “Invader’ in the past, and more recently ‘Minuendo’,’Playgroundlabel.com’, ‘Alma Soul Music’, ‘Dubherecordings’, ‘Pong Musiq’, ‘T.E.A.M recordings’, ‘RedSonja Records’ and ‘Lessismorecordings’ have edited his music strongly supported by djs and producers all over the world. In the beginning of 2010 he succesfully started to perform his music live! Also actively collaborates in Playground, a platform that unites Netlabel, music software academy and promotion of events. And with Abismal, a new and very promising project based on dubstep, uk funky, nu techno… performing parties in special locations. Comandante Zero is a Brooklyn-based drum/bass/laptop duo consisting of bassist/producer Dan FreeMan (CØm1x) and hip hop drummer/producer Ken White who mix the heavy live groove of bygone dance bands like Chic, a modern electro sound and baritone Leonard Cohen-esque English and Spanish vocals. In 2008 they created a unique set fusing live grooves with laptops running Ableton Live and began a cutting-edge musical/visual collaboration with artist Øh1ØM1ke.